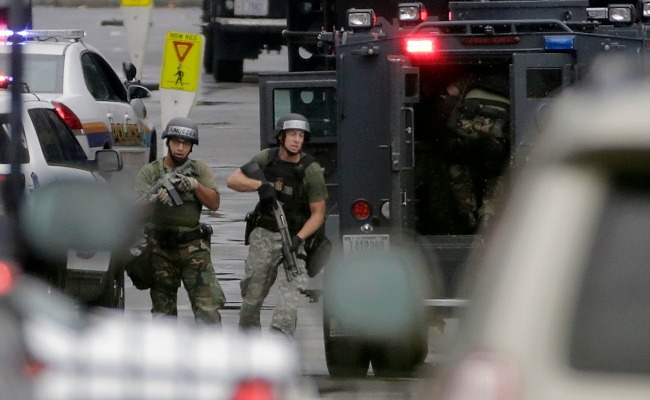 The Washington Navy Yard attack was the biggest mass-casualty shooting since gun control failed. "We are confronting yet another mass shooting," President Obama said Monday. It was a simple factual statement, entirely lacking in prescriptions or suggestions for action, and it seemed to sum up so much about a day that saw the horror of a fresh mass shooting -- and one taking place inside the city limits of the nation's capital, where earlier this year Congress considered and then squashed potential new gun regulations. By Monday afternoon it was clear that the Navy Yard shooting had been the deadliest mass-casualty shooting since the post-Newtown legislative efforts to alter America's gun laws failed in April. That gave reactions to the unfolding tragedy a new backdrop of futility, as it quickly became clear that the latest massacre will not lead to new gun laws passing in the Senate, either. There aren't the votes, said Senator Joe Manchin, Democratic co-sponsor of a failed spring effort to expand background checks. Obama's decision to address the shooting only briefly in remarks Monday, before plunging into a planned speech about the fifth anniversary of the financial crisis, seemed a concession to the new reality. "When it comes to common-sense legislation to reduce gun violence, the president has been very clear. And he was very clear with his significant disappointment with the Senate in its failure to pass common-sense legislation that was supported by an overwhelming majority of the American people -- by majorities in blue states, purple states and red states. And that was a shame," White House Press Secretary Jay Carney said later in the day, when asked why Obama had not said more. "And we will continue to work to take action to improve gun safety in this -- to reduce gun violence in this country through executive action, and hopefully Congress will take action to reduce gun violence as well." The take-home: Everything will be as it was going forward. Disrupted, every so often, by a madman. Carthage, Fort Hood, Tucson, Aurora, Newtown. Nineteen other mass casualty shooting events with four or more deaths have taken place since Obama took office, according to a catalog compiled by Mother Jones. Monday made it an even 20. This is a form of terrorism we have learned to live with. Except that there are so many who cannot, because they are dead. As the day progressed, the Navy Yard shooting's body count ticked up through disjointed, incremental, and sometimes contradictory reports. Three dead. No, make that six. Seven -- eight if you count the shooter. Twelve, announced D.C. Police Chief Cathy Lanier. Scratch that, later in the day: it's 13. Once, it could be expected that impassioned calls to action would follow such a mass murder, part of the template of our grief. What happens now that we have such a recent experience of reform efforts failing? We are confronting yet another mass shooting. It is true. And also the certainty that we will do so again.